After the mayhem that was the long weekend we keep the party going for another glorious Sunday. This time we hand the reigns over to the legends at ‘By Your Side’ who are always followed by an energetic crowd. First up, we have Jordy Waller, who will be warming up our ears in the earley hours of Sunday arvee. Jordy is the man in charge of Original vibe and from his podcast series as well as his own mixes, we know he can bring a smooth and fun ride to any party. Next, we have the infamous Mr. Bligs AKA Sean Condell. After vibing it at the monthly ‘BYS’ residency at SLYFOX he’s back to bring his deep and dubby sounds to the open air that is SASH by Day. Following in the driver’s seat, we have head honcho and BYS boss Mr. Cool aka Jimmy Galvin. This lovable character has held the reigns at WeLove, Oomph and SASH by Day to name a few. We are more than happy to welcome the creator of ‘Two Up And Techno’ to bring his deeper melodic and vocal driven beats to our courtyard & last but not least, Bringing the boys HOME with a bit of Oomph is one of our favrourite Brazilians – Tezzel. (BYS) is a swiftly-evolving & naturally progressing Australian music brand. 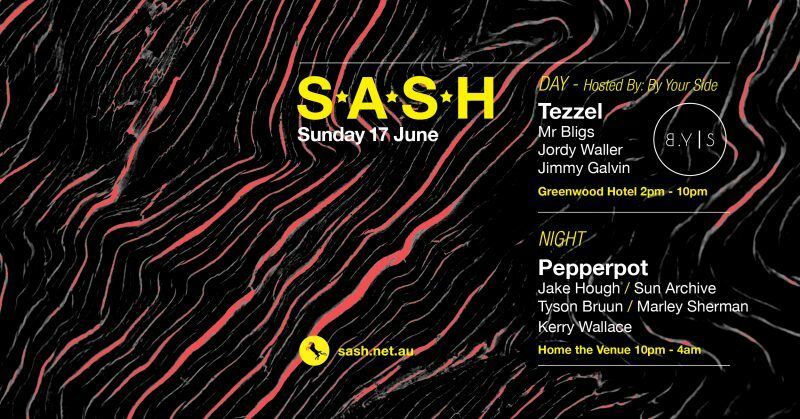 Their tight-knit team are responsible for the classic “Two-up & Techno” parties at the Chippendale hotel, alongside countless takeovers, sold out boat parties and a whole lot of good times. This week, they take on S.A.S.H by Day. Riding into the night we present some of our nearest and dearest to help you feel warm and fuzzy after last week’s momentous Long Weekend at HOME. It’s taken a while for the young prince of Manly to lose his Terrace virginity as we’ve been waiting for when the timing is right. More than deserving to open the infamous Red Room, Lokomotiv head honcho Tyson Bruun takes us to midnight. Celebrating a quarter of a century on planet Earth, SASH Marley throws down a couple hours of sherm-specials and taking the top honours before he heads back to Europe for a short stint; minister for quality control Pepperpot sends it well into next week. Back in the blue room to provide the chunk, the funk and all things deep we have Sun Archive, Kerry Wallace & the “king of the close” Jake Hough. If Greg’s 6 hour session last month wasn’t quite enough Pepper for your pot, we give you another 2 hours of Lambo Power. This guy has been boiling for 20+ years and after countless appearances at S.A.S.H, each time keeps getting better. Come say see you soon before old mate Pepperpot heads to Europe for their summer.